The global land and ocean temperature departure from average for March 2018 was the fifth highest for March in the NOAA global temperature dataset record, which dates back to 1880. The year-to-date (January-March) global temperature was the sixth warmest such period in the 139-year record. 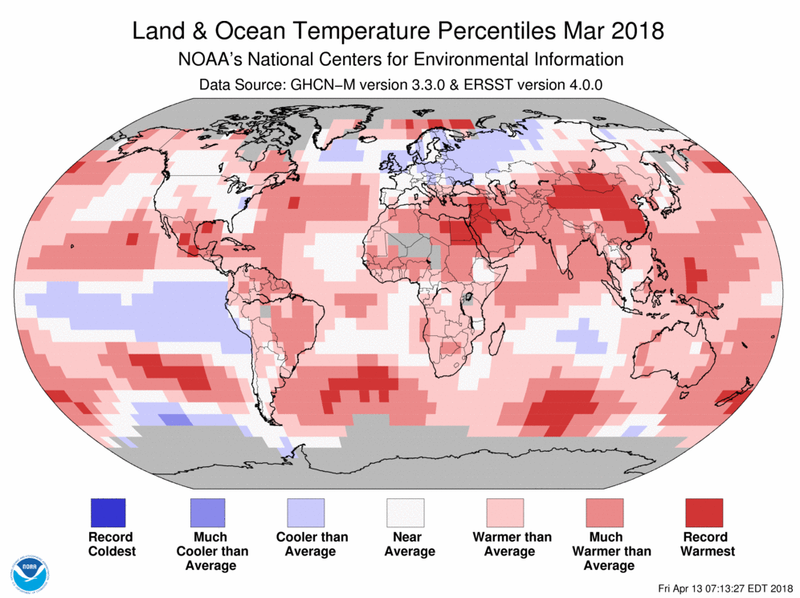 The March temperature across global land and ocean surfaces was 1.49°F above the 20th century average of 54.9°F and the fifth highest for March in the 1880-2018 record. This value is 0.72°F cooler than the record high set in 2016 and is the smallest March temperature departure from average since 2014. The years 2015-2017 represent the three warmest Marches on record. March 2018 also marks the 42nd consecutive March and the 399th consecutive month with temperatures, at least nominally, above the 20th century average. The March globally averaged land surface temperature was 2.68°F above the 20th century average of 40.8°F. 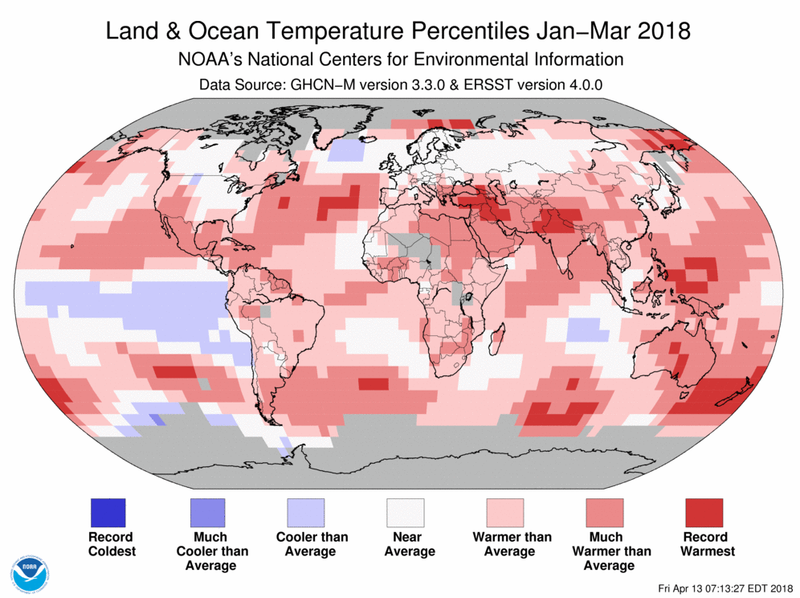 This was the seventh highest March land global temperature in the 139-year record. However, it was the smallest March temperature departure from average in the last four years. Cooler-than-average conditions engulfed much of Europe and western Russia. Europe, as a whole, and several individual European countries had their coldest March in five years. While Europe was reeling in cold temperatures, much of central and southern Asia was experiencing much-above-average conditions, with several countries setting new national March temperature records. The March globally averaged sea surface temperature was 1.04°F above the 20th century monthly average of 60.7°F – also the smallest March ocean temperature departure from average in the last four years. Overall, it was the fifth highest global ocean temperature departure from average for March since records began in 1880. The March average Arctic sea ice extent was the second smallest in the 39-year record at 436,000 square miles (7.3 percent) below the 1981-2010 average, according to an analysis by the National Snow and Ice Data Center using data from NOAA and NASA. Only the March Arctic sea ice extent in 2017 was smaller. On March 17, the Arctic sea ice extent reached its annual maximum extent at 5.6 million square miles. This was the second lowest maximum extent on record, behind 2017. The four smallest Arctic sea ice maximum extents have occurred in the last four years. 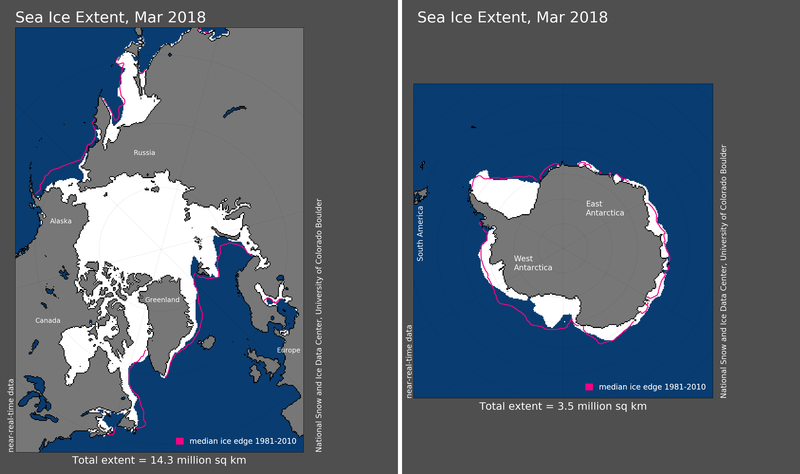 Antarctic sea ice extent during March was 200,000 square miles (12.4 percent) below the 1981-2010 average, the seventh smallest March extent on record. Antarctic sea ice rapidly expanded during March after the annual minimum extent was observed in February. Sea ice expansion was particularly rapid in the Amundsen and eastern Ross Seas. According to data from NOAA and analyzed by the Rutgers Global Snow Lab, the Northern Hemisphere snow cover extent during March was 660,000 million square miles above the 1981-2010 average. This ranked as the 13th largest March extent in the 52-year period of record, and was the largest since 2011. The North American March snow cover extent was the fifth largest on record and largest since 1978, while the Eurasian snow cover extent was the 22nd largest. The year-to-date temperature across global land and ocean surfaces was 1.33°F above the 20th century average of 54.1°F. This was the sixth highest for January-March in the 139-year record. The 2018 year-to-date value was 0.77°F lower than the record high set in 2016 and was the coolest such period since 2014. The years 2015-2017 rank among the three warmest January-March on record. The year-to-date globally averaged land surface temperature was 2.18°F above the 20th century average of 38.5°F and was the sixth highest for January-March in the record. This was also the smallest January-March global land temperature departure from average in the last four years. The year-to-date globally averaged sea surface temperature was 1.01°F above the 20th century average of 60.6°F – the fifth highest for January-March in the 1880-2018 record. This value was also the smallest January-March global ocean temperature departure since 2014. 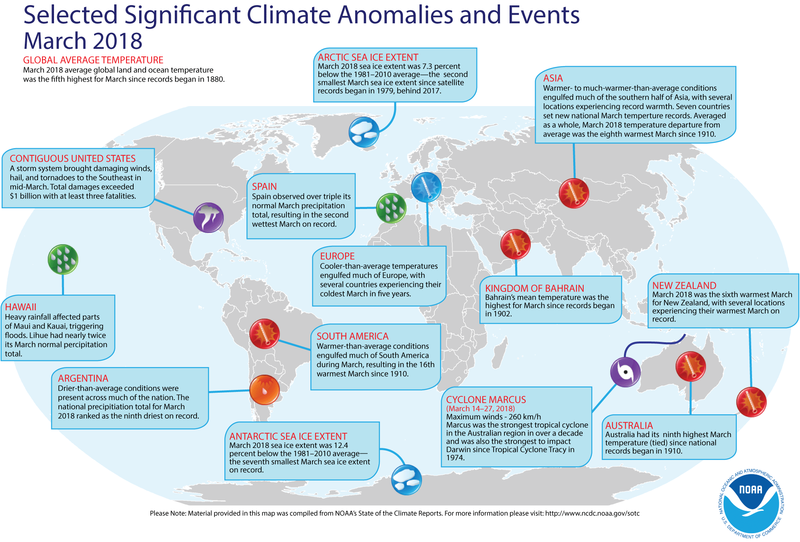 For a more complete summary of climate conditions and events, see our March 2018 Global Climate Report.